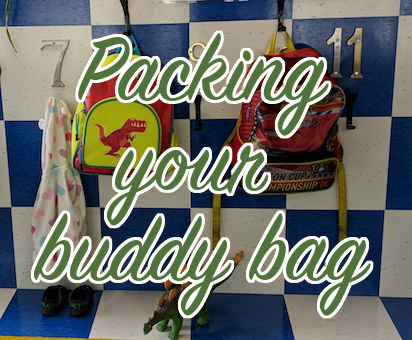 The toys, snacks, and children’s necessities, come in all shapes and sizes, and when they arrive at daycare, it’s time to put the things away. At Buddings, we are not nut-free, but teachers keep track the snacks and food to make sure they are kept safely. Labels make this possible. There are naming systems are both our centres, and on your first day, we’ll try to walk you through it. Weather wear, for neighbourhood walks – inc. sunscreen, hats, boots, mittens, etc. Food for snack times (10am and 3pm) and lunch (12 – 1pm) in a labeled bag or lunch box, should be kept out of reach of children. At Broadway, please leave it in the cubbies at the front. At Storybook, the shelves are inside, high up. You do not need to pack cutlery. Please don’t. Having a backpack or bag keeps everything together, and picking one out can be a low-stress shopping trip where your child gets to choose their favourite. It takes some practice… but if you forget, we’ll put it in the Left N’ Found for next time. Speaking of starting off, read more about starting slowly.